Supersalaries – Along with the top link, CEO compensation is out of control. Donald Sterling’s donation led to award – How can he be getting an award? For donating money after improprieties? Kareem Abdul-Jabbar at least had interesting thoughts. The Cube, as usual, is right I think. People are allowed to be morons. Of course, the ever present news about Clive Bundy. Fortunately it’s dwindling. Fortunately there were a few nice things I saw as well. Dr. Jack Ramsay has been a part of the NBA as long as I can remember. I have enjoyed hearing his voice and his comments for many games across the last 20+ years. He passed away the other night, and I was sad to hear it. I watched a bit of the tribute on Sportscenter last night and will miss him. A farewell from his son. After surgery Fri am, I've been mostly taking it easy, but now it's back to work. Got kids to school and at the standing desk. Overall I feel good and can walk fairly normal. Other than this big brace on my leg that slows me down and makes walking funny. I have been making an effort to bend a bit as I walk and it's going OK. I've been trying to use the leg a bit in bed as well and while out, but I've been cautious. Certainly don't want set backs. Overall doing well, but I think it's time to start being more regular and serious with some leg movement. I showered yesterday, and am confident I can do that again fine, so I'll be trying to generate a little sweat here and there. However I also know I need to get swelling down, so not too much time at the desk before laying down or sitting down. Random views from the season. My last day before surgery, and hopefully the last day with this bum knee. I know it will be some time before it's back, and the patellar tendinitis will likely dictate recovery times, but I'm looking forward to getting better. I had planned on yoga today, and then maybe karate, but when I mentioned it, Tia said she'd like to attend yoga with me tonight, so I switched. I took the dogs for a walk today and am planning on yoga tonight. Then to bed early, since I need to be up at the crack of dawn, heading to surgery. Nervous, and worried, but only a little. I need to get this done and there's no sense worrying about the procedure. I'm already thinking of how to move on beyond it. My back was still sore today. In fact, when I lay down on the massage table, it was angry and achy from the change in stress of supporting me. However after 75 minutes of hot stone massage, it felt much better. Still slightly sore now, and my neck is strangely aching, but overall, much better. Yesterday was a busy day for me. I had planned to get up early and move, but ended up having a lazy start to the day. That was fine because today I'm glad I didn't start earlier. First I went out and worked on the sprinklers for my shrubs and tree. Only one left, and I replaced a few of the drips with some sprinkler heads on tiny stakes. I tested that and got those all working, getting lots of water spread to the various plants. Hopefully they'll grow and prosper this year. Next I put up a bit of snow fence around them. One side has seemed more windblown from them, so adding in some fencing should protect them. It wasn't overly hard, or even that time consuming, but it ended up having me go back and forth a bit, and stand up and reach down a lot. Once that was done, I was looking for more projects. I thought about cleaning the garden area, but I need to flatten down some grass and the weed whacker wasn't working, so I left that alone. Next I was going to turn on the sprinklers, but the dog area stunk, so I spent 30 min cleaning out the manure, which I'm sure didn't help my back. I did take a break then, which I needed. After a little lunch, I was back at it, turning on the sprinklers for the year. It's probably time and I found 3 broken heads and one loose one. More work to do this week to try and get those working, but I was overall pleased that things were in good shape from the winter. I had planned on getting out in my car and tried to jump it, but it was resistant to starting and the battery was dead, so I stopped, giving the portable jump device an overnight to charge. I did start working on another feeder, and my back was tired and tight at this point, so I was happy to knock off and get ready for dinner. Today it's tight and sore, aching a bit. Pilates was tough, and I am looking forward to laying down tonight and resting. Not quite traditional, but we decided to go out last night as Kendall and Kyle were looking for a bit of a celebration. After a long day for everyone, we ended up making a night of it at On the Border, enjoying some Mexican food and entertainment from the boys. Somehow we got on the idea of voices, with Delaney doing a great "Bain" from The Dark Knight Rises. Then they continued mimicking various accents from around the world with Tia and Kendall as judges. There was an extra practice clinic today and we signed Kendall up. The first hour was conditioning, which we hadn't told her about, but we thought she could use. I dropped her off and then headed out so I wouldn't hear complaints. I had a few errands, and then returned to watch the last hour (of 3). They were working on passes at first, and Kendall did well. Only six girls, and when they talked about having a setter, Kendall volunteered. Couldn't believe that. She did well, better than most, but most of the girls weren't at her level. There was one other girl from her team, who also did well, but the rest were younger or the B team. When they went to hitting, they broke it down, working slowly. Kendall messed up a couple, but then had some great hits, slamming the ball down. She said she felt good, and I'm looking forward to seeing how she does Mon at practice. It was short, and we didn't do much, but it was nice to get away. Dinner at Hacienda, then nothing catching our eye, so we checked in and fell asleep early. No dogs, no cats, no kids, we woke up peacefully. Need more of those days, just the two of us. Or overnight, rather. Tia and I have a date tonight, in a hotel, getting away from the kids for a day. She has to work tomorrow and I have some things to do, so it's not long, but it's a chance to get away after our two attempts in April failed. Dinner, maybe a comedy show or a movie. The Nelson Touch is a sequel to Ark Royal, which I enjoyed a few months back. This one takes place a few months after the other one, with the Ark Royal being outfitted to head back into the fight against the aliens. Ted is an admiral now, losing command of the ship, but James has moved up to captain. They leave with a mixed force, a couple US carriers, along with French, Chinese, Japanese, and maybe another one. They head to a system that is suspected of being an important one for the aliens as far as infrastructure matters. Their plan is to wreck havoc and try to turn the war. It's an interesting journey, once again with challenges. The Prince, an heir to the throne, is on board as a pilot anonymously. There are many new members, some of whom haven't fought, and lots of rookie pilots. It almost seems as though the humans are at a disadvantage here. I enjoyed it, and it's a nice follow on to the first one, though predictably, the Ark Royal survives as some other ships don't. We also start to see the introduction of how planet based battles might take place. A good read, but read the other one first. Yesterday I took Kendall to volleyball practice. The girls started to warm up and one of the coaches was a little angry, yelling more than usual, pressing them to work hard. After about 20 minutes, he said he was done and they weren't looking good. And they were leaving for ice cream. I wish I'd recorded video because the girls faces went from being a little timid to very excited. It was an act. The coach had bet them awhile back if they could win a game in a tournament and not let the opponent score 10 points, he'd take them for ice cream. They did, and yesterday was the day. He'd emailed parents on Tuesday, so we knew, but kept quiet. As a result, the kids had gun, but it was a bit of a bust for practice. We got home a little early, 7ish, and Kendall wanted more practice. We did some in the front yard, but the sun went down, it was a little chilly, and we called it after about 20 minutes. However I told her I'd do more today. Sure enough, she got home and then went upstairs to change, coming back to my office shortly and asking if we were going into the arena to practice. We did, and had about 30 minutes of passing and hitting with each other. Fun, and I wish we could play tonight, but I'm tired, and she has a test tomorrow. A re-read. After going through Never Come Back, I opened this and re-read it on the airplane. Back to yoga today, which felt good. It's been over a week and with travel, I needed a good, hard workout that moved slow. This was just what I wanted, with a new teacher, lots of flow, and sweat. A good workout. I'm going to miss yoga when I'm healing, and hopefully I'm not out too long. Afterwards I swung by the doctor's office since they needed to draw blood. They weren't sure last week and didn't do it, but called to say I needed to get in there. So I did. I managed to not pass out, though I was breathing slowly and deeply, with my heart rate increasing and a little wooziness. I don't like needles. I only glanced at my arm a couple times, mostly because it was going slow. I'm sure it was a minute, but it felt like 10 while the tube slowly filled. At least I'm done for now. Here was my speaking schedule, a page I updated Wed night. Late yesterday I got emails notifying me of acceptance to a new event. Two whole days without something scheduled. A long week in Orlando and I’ve been here 3 days. Arriving Sunday, having dinner with my business partner before the conference on Monday. I had a talk on Monday that went OK and then two today that were better, but I was worn out at the end. I sat through a talk, but was barely paying attention. I managed to watch the afternoon keynote and then I needed some alone time. Three weekends of work/travel and then here is too much. Already I turned down a talk later this summer and deferred decision on another as I realize the travel has gotten to me. Now hoping I can get a flight change in the am. The start of a new space opera. In this one humanity is in space, settling multiple systems, with each mostly under the control of a single Earth country. 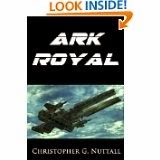 The book is written from the perspective of the UK and when a system is destroyed after encountering an alien race, only the Ark Royal, an ancient British carrier is really ready to go and meet the aliens. It's an old carrier, with much more armor than modern carriers, but the modern carriers were decimated by the aliens. The Ark Royal is pulled from its mothballed orbit around Earth and reconditioned. It's sent under the command of its drunk of a captain because he's the only one that can run the ship. With a ragtag group of troops, he heads out. It's an interesting story, one that shows lots of humanities flaws and problems. It doesn't use the real world physics of the Lost Fleet series and many starfighters, in the tradition of Battlestar Galactica (with no relation to space physics) are used extensively. However it's a fun read. After reading the John Rain series, I was excited and went back to Lee Child and Never Go Back. This is the latest Reacher story, where he returns from South Dakota to meet Susan, the commander of the 110th that he spoke to on the phone a few books back. A re-read for me and an exciting one. 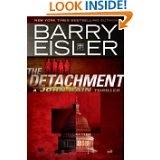 The modern John Rain novel, the Detachment has Rain back in Tokyo, years later. He's broken up with Delilah and is training at the Kodokan. When two CIA operators tail him, he kills them, unaware that there were four people sent to contact him and hire him and Dox. The other two are former ISA (a CIA like entity) operators under the control of Col Horton, who convinces Rain to help him. He's trying to prevent a coup in America. It's a neat story, and a little scary. As expected, there are twists and then twists again. The book walks back on itself and keeps you guessing, just as Rain does. It's almost like a gathering of some great characters, with an exciting finish. I hope there are more, though Rain is getting older. Read the others first, and then enjoy this one. A sudden transition to summer for me. It was cool last night and cold this morning when I left around 8 for the airport. Rain coming down, rarity for Denver, and snow in the forecast for the afternoon. A jacket and vest on for the trip out. I'd have rather been curled up with a book, but no chance of that. The flight was fairly uneventful, though a bit bumpy. I had planned on some exercise and so I worked on the plane. A good thing since the VM I'd copied over wasn't complete and I was a bit stressed. Fortunately I got things to work. I landed and walked out of the air conditioned terminal to a hot day. 80+ and as soon as I got to the car I had to pull my vest off. I was certainly glad I didn't have a hat. It was also bright, so my first stop out of the airport was to get sunglasses and cold water. Then it was a drive up north for dinner with Andy before hitting the hotel. Things hadn't gone as planned and it got late quick, but I managed to hit the treadmill late for a little exercise. Maybe more like 14 hours. I presented at SQL Saturday #297 in Colorado Springs today and got home a bit before 7. I turn around and leave tomorrow a bit before 8 for the airport, heading to Orlando. I hate these turnarounds and what was some excitement to go to this next conference and see some friends has turned into a bit of trepidation from the travel. Looking forward to getting home Wed and no trips for a few months. Another name change. Extremis was The Last Assassin earlier. In Extremis, Rain has learned that he has a child. Tatsu has manipulated him and even though he meets Delilah in Barcelona to rekindle romance and try to go closer, he’s torn. He tells her about his kid after a few days and she’s upset. The rest of the book has him and Delilah somewhat on different pages as neither is willing to admit how they feel, but pursues something. Rain goes to New York to see Midori, but Yamaoto has her under surveillance. With Dox’ help he sees her, but then accidently runs into a Chinese triad member and must kill him. Then the bodies pile up as he kills the boss and goes to Japan to try and force a war between the triads and yakuza, all to keep Midori safe. It’s a wild ride. Rain in New Yrk with Midori, then in Japan terrorizing gangs, and then a showdown in Yamaoto as he recruits a reluctant Delilah to help. A very fast paced and exciting read. My physical was today. I must have put the appointment in my laptop on the wrong time zone because I had 12:30, but when I showed up almost no one was there the few that were inside were leaving for lunch. Oh well, lunch for me. They treated it like a pre-op and just did some vitals and an EKG. That EKG worried me a little. I've never had one and I don't like bad news. I didn't think anything was wrong, but when the lady mentioned that she head something funny during my pulse, that didn't help. When she asked if I had an arrhythmia, I wasn't feeling very calm. When she had to redo the EKG because of a sensor not reading, I was ready to walk out. However everything was fine, with the PA noting the EKG was clean and I appeared to be healthy. Blood pressure around115/82 and pulse at 66. Another re-read, Redemption Games was originally published as Killing Rain. This one takes place right after the last one. Rain has traveled to Manila, and he’s recovered. Dox is with him and they are working for the Mossad to take out an arms dealer. However Rain’s brush with death, he hesitates and manages to botch the job, kill the bodyguard and two CIA employees, all while saving Dox’ life. They flee to Hong Kong, worried about both the Mossad and CIA. They should be. The Mossad is concerned about blowback from the CIA and plans to kill them, sending Delilah and Gil to get them. Meanwhile there’s CIA blowback as we learn that Hilger (from the last book), works with them. We slowly see things untangle, and we find Rain working to figure things out (that we know as readers), while trying to stay alive. At the end, there’s a long, exciting chase as all the people come together. A great read. Yep, I did it. Applied to Red Rocks Community College in Lakewood. It's the first step towards my sabbatical. I've investigated a few things, but nothing has moved forward. However Red Rocks opened registration this week and I applied. I plan on taking some woodworking class, but we'll see if my application gets through. It's been over a month, and I was busy, but I decided to go swimming today. It was short (30min, 14ooy), but it felt good to be moving in the water. I grabbed this as part of the Amazon First program, which gives Prime members a free book a month. This was slated for release and I grabbed it as it was the only mystery/thriller type item available. Mickey Outside is a crime novel, one written by the criminals. It starts with Mickey, serving time in a minimal security prison after ratting out his old partner and company in a large bank. He was involved in some fraud, but he managed to get out, though without any assets. His wife divorced him and he was fined the rest. But he has a plan, and he has to find a partner in prison. He does, and gets out, going back to New York with his scheme to defraud someone else. This time, however, he has revenge mixed into the plan. It’s an interesting ride. Hard to feel sorry for someone that defrauded people out of millions so he could make millions. Going back into part of that life, we see him as a person, but not one that you’d likely want to work with or be around. He’s still not really a good person and wants to make money. As we all do, but he’s perfectly willing to break the law again. Back to me Tues, 10am, Hot Power Fusion class today. I haven't been in over a month, traveling, having issues that made me late, and more. I almost didn't make it today when Uma ran away, but I managed to get her back thanks to a neighbor and then make the class. Felt great. Lots of sweat and hard work. A rare night flight for me, leaving this evening for Las Vegas. I speak tomorrow and then back early Sun. As a result, I've been trying to work all day, even though it feels funny to me to be working and not heading to the airport. Semi distracted, but I have gotten a few things done. I packed, Tia cut my hair, I loaded the weekly newsletter and then did some writing in the arena while Tia rode. Now to get Delaney, shower, and leave. The first step to surgery was the pre-op visit. The sugeon met with me, explained what he'd do and why and everything sounds good. A fairly simple ACL using a cadaver tendon as a bridge. He's drilling through and using an endobutton to hold the top in. He'll use some type of coral based bio-absorb-able substance to anchor the bottom and he said I'd be in a brace that night, but able to bear weight if needed. Should be walking within a week and then PT with most sports inside 3-6 months with a brace. He did suggest I give up running. He said it's good for his business, but he says I can do better longer if I avoid the constant running. I'll have to think on it, but Tia and I are considering it. Maybe the best thing for long health is to move to more elliptical and biking. In any case, now a week away from my physical check and then 3 weeks from surgery. Recommended by a friend, I grabbed The Martian, but didn’t start it right away. I wasn’t sure if I’d like it, but once I did on a recent trip, I was hooked. It’s incredible. The third mission to Mars has 6 people abort when a storm hits. The book opens as the journal of Mark Watney, the man left behind. He’s hit by an antenna, his suit punctured and damaged as the group heads to the lander that will take them back up to their orbiting ship. His vitals go flat, the crew can’t find him and they have to leave before the storm blows their ship over. A sol is a Martian day and we get diary entries as Mark wakes up, realized his suit sealed itself, but he’s in trouble. He makes his way to the canvas habitat (The Hab) and cleans and stitches himself up. He then realizes that not only was he left behind, but he has no way to communicate with the ship or the Earth. However the 4th mission to Mars is planned. The problem is he needs to survive for 1500+ days until it arrives. An issue when the mission was supposed to be for a month. We watch his diary as he overcomes challenge after challenge, thinking of ways to find enough food and plan his trip across Mars to the next landing site. The book evolves as it goes back to the time before the storm and the view from the other crew members on their way to Earth, as well as the NASA groups on Earth who realize he’s alive. It’s a wild journey, one that lasts 900 days, though we don’t get 900 entries. However we get a lot and it’s like Gravity, but with more realism. I loved this one. Kendall had a sore arm at volleyball last night. It was the first time that she really hit the ball hard many times. It helped that two of our tall, front row girls were absent. As a result, Kendall was up in the front a lot as a primary hitter for the practice. I’m not sure what the coach said, but he got her to hit hard and she had some great hits. A couple even bent downward, curving, as they crossed the far side of the court because she’d hit them hard with with a spin. I could see her rubber her arm and working on it and she slowed down near the end of practice. More hitting than she’d done in a long time and the last 15 minutes or so were her hitting with regular, less force. I think she impressed him, but we’ll see. On Monday I took Kendall to volleyball with my vest on, but it was a bit warm. It was even warmer on Tuesday. Yesterday I took the dogs for a walk in the afternoon before I picked up Kendall. I wore shorts, tennis shoes, a sweatshirt with a hood and a knit hat because it was a bit windy. We had a nice walk, and I was actually warm as we were heading back on our 2 mi walk. Today was a late start, and Delaney actually came in early and asked if school was delayed. When I got home late last night it was raining and I hadn’t expected much change. The car looked like this and I’m glad I went out early to start it when I saw snow so it could warm up for the drive to school. The drive was OK, but slow and I was careful. People were going very slow, which was good as the roads got worse as I came home. So much for swimming today. Gonna stick inside. Winner Take All is the third book, and after re-reading the first two, I had to continue on. In fact, only the limit on Kindle borrowing stopped me here (for now). Rain has made it to Brazil, established his cover and spends time there. However when he contacts the half Portugese/half Japanese hostess living there, the CIA tracks him down. They twist his arm to help them, killing a suspected arms dealer in Macau. It’s a wilder ride, one where Rain can’t fulfill the contract at first because he meets Delilah. We end up starting to find that the life of an assassin isn’t glamorous, trust is hard to come by, and paranoia is a way of life. This was one of those books that made me realize your life can’t be great when you can’t really relax. However we meet Dox and Delilah, working for separate groups and we start to see the beginning of friendship as Rain learns to trust Dox. A very wild ride, with an exciting finish as the bodies pile up in short order in this one.